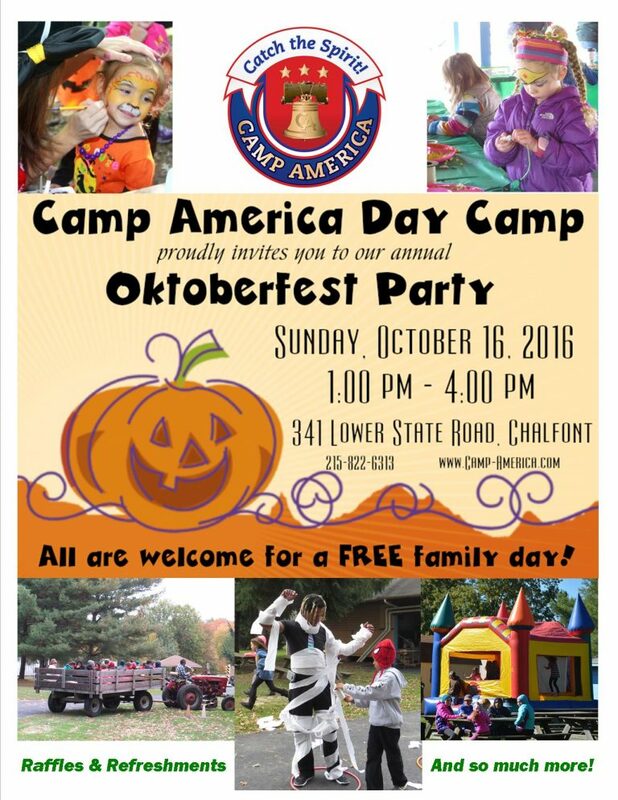 Camp America Day Camp proudly invites you to our annual Oktoberfest Party on October 16, 2016 from 1pm – 4pm. The party will be located on our beautiful camp grounds located at 341 Lower State Road, Chalfont, PA 18914. This is a FREE community event and we encourage everyone to bring a friend. The Oktoberfest Party will be full of fun including games, crafts, raffles, face painting, refreshments and so much more! 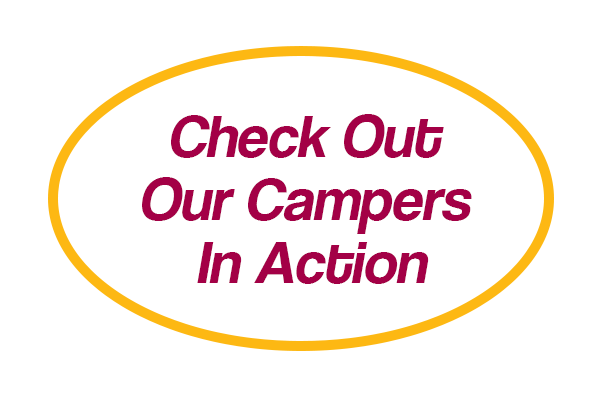 Each year Camp America Day Camp invites their camp families, staff and community to come and play! Homemade, allergy friendly snacks are made by our loving staff for all to enjoy. Every family will receive a raffle ticket to have a chance at winning a special prize. A large pumpkin is always on display and if you are the lucky one to guess the weight then it is yours to take home. We may even have a lucky birthday party winner! 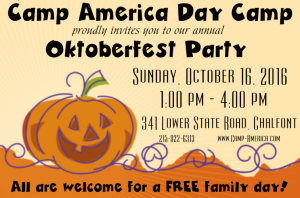 If you would like to have a chance to win a party at Camp America be sure not to miss out on the Oktoberfest Party on the 16th of October. If you cannot make this event, don’t worry you can still have a party at Camp America. Visit http://freestyledancepa.com/birthdayparties/ for more information. We will end our Oktoberfest down at our Fire Pit roasting marshmallows and singing songs. We hope to see you all on October 16, 2016 for an Oktoberfest party to remember.